I live on a page in a book. My name is written in a curly and swirly font, along with long descriptions of sleepless nights and filled bookcases. First of all; this edition is gorgeous - and filled with lovely details. With richly illustrated endpapers, shiny silver edges, a ribbon silk bookmark and a very symbolic cover design, it is a treasure for every Neil Gaiman fan and every admirer of beautiful books in general. I am so happy to display it on my shelf. Of course the two novels it contains are gorgeously crafted as well. Neil Gaiman truly is a wizard, and every word he writes is filled with magic. I especially like how these two novels correspond to one another, without being directly intertwined at all. "American Gods" draws its reader into a wondrous world of mythology and belief, while "Anansi Boys" focuses solely one aspect of that world. Perhaps it is best (and most correct) to read "American Gods" first; but in my opinion it definitely would be possible to start with "Anansi Boys" as well. I recently read "American Gods" (You can read my review here), and it left me puzzled, dazzled and confused at its complexity. I never fully grasped the many strings of Gaimans tightly woven storyline, and I will need to reread it carefully and with undivided attention another time. 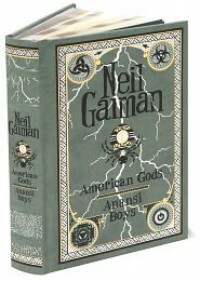 "American Gods" left me undecided, so I postponed "Anansi Boys" for a couple of weeks. I wasn't expecting a lot from it - and what a foolish mistake! "Anansi Boys" turned out to be completely and utterly mesmerizing, a page-turner, a quick, fun and beautiful read. I was dragged into one of Anansi's stories, left in his glittering spider web, and caught in a cocoon of dark strangeness. My heart ached for Fat Charlie, I sent blaming glances at Spider, and I was in awe of another, even curiouser, world of Gods, religion and myth. The story is witty, it is fun and it is endlessly charming. Gaiman's imagery never fails, and I loved the idea of someone being divided into two halves of a whole. The additional starfish-growth was hinted long before I even realized what was going on - which is such a typical trick of both Anansi and Gaiman himself. It is in fact quite fitting that Gaiman chose to examine the God of stories, of tales, of words and of trickery - because he himself is such a God. “Stories are like spiders, with all they long legs, and stories are like spiderwebs, which man gets himself all tangled up in but which look pretty when you see them under a leaf in the morning dew, and in the elegant way that they connect to one another, each to each.” - Neil Gaiman, "Anansi Boys"